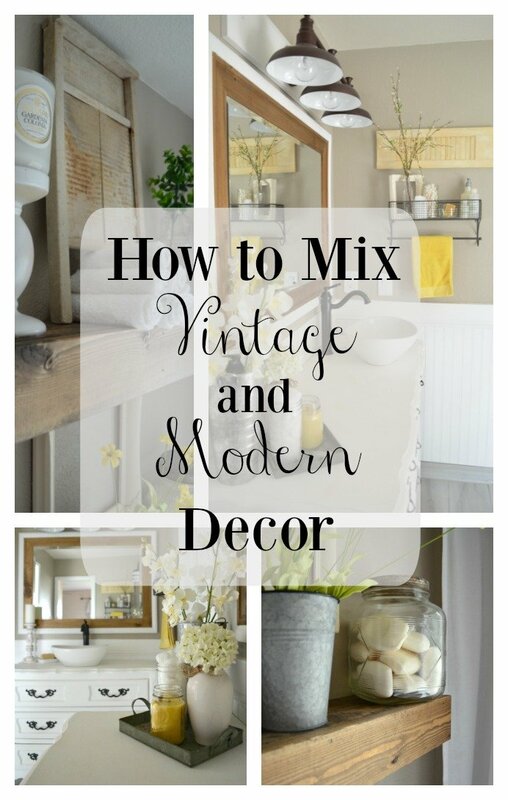 Today I’m excited to be joining a talented group of bloggers to bring you a fun home tour all about mixing vintage and modern decor. If you’re new here and joining me from another blog, welcome to Little Vintage Nest! And if you’re a regular around here, you already know I’m crazy about vintage decor. Obsessed is actually a more accurate description. I love bringing old things back to life and I see so much beauty in frayed and tattered covers, chippy paint, and rusted edges. And although decorating with vintage style can sometimes be a tricky balance, I’ve found the best way to do this is by selectively choosing antiques that compliment your style and space. 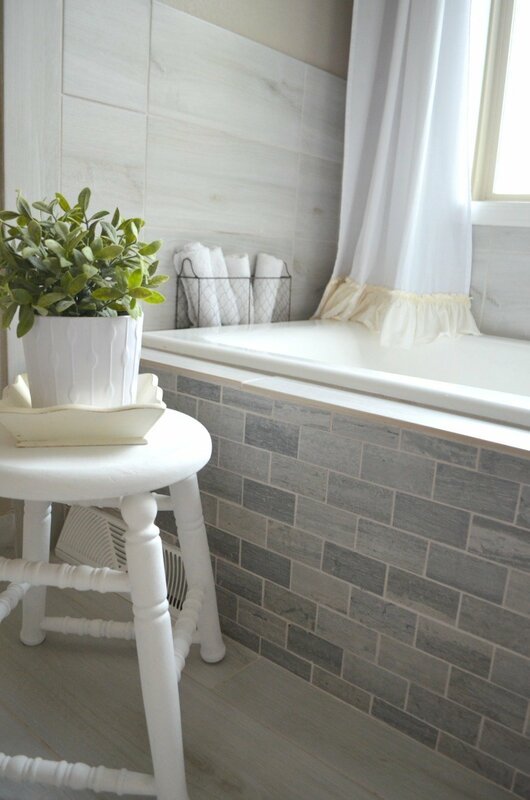 Today I’m sharing a little tour of our master bathroom, which is a great mix of old and new, as well as a few tips that will help you create a similar look. And don’t forget to check out all the other bloggers on our tour, their links will be listed at the end of the post! The first thing you’ll notice when coming into the bathroom is this awesome old window. How cute is this?! It came off a 100-year old house in Colorado. It was as a gift from a few sweet friends and I looooove it in this spot. 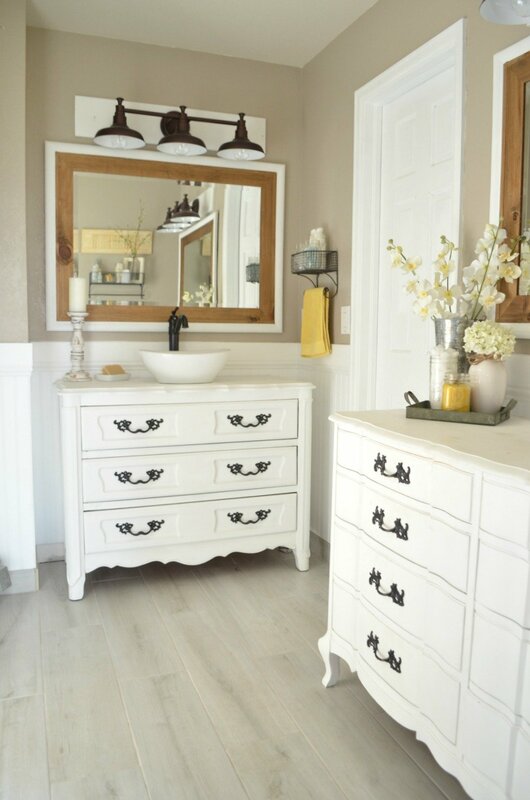 A simple focal point like this is a quick and easy way to bring vintage style to any space. 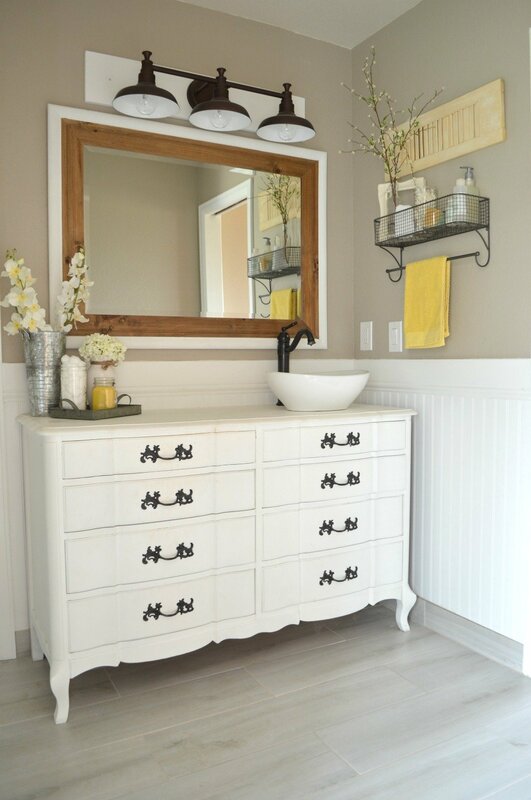 Both of the dressers in this bathroom were thrifted finds that I transformed into vanities. This is an extreme example, but painting old furniture is one of my favorite things to do. And it’s a great way to incorporate more originality and vintage style into your home. I kept it classic and modern here with a simple white vase, candle, and metal tray on my vanity. I wanted our bathroom to have a vintage farmhouse feel, so these affordable light fixtures from Amazon work perfectly. 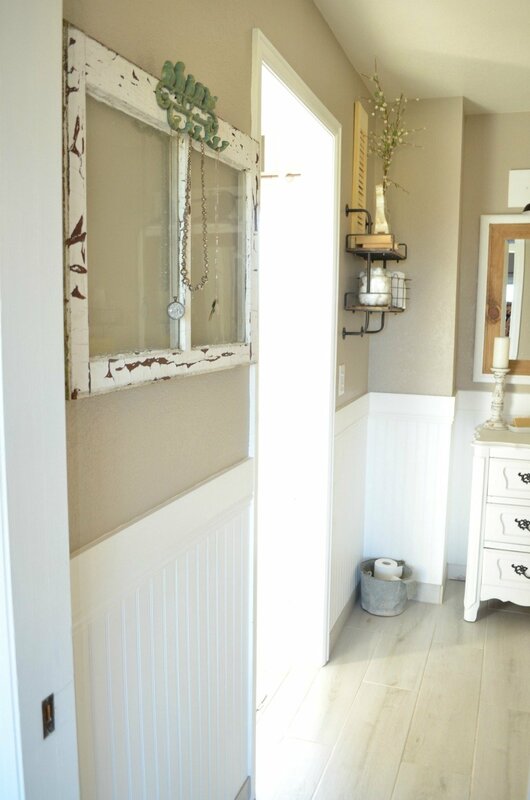 I also used an old picture frame and shutter to spruce up this corner of the bathroom and add a touch of vintage charm. Can you spot that square bowl there under the white pot? It was a vintage find I came across for just a few bucks. I simply painted it white and distressed it. Easy peasy. And it’s a great layering piece that adds the perfect amount of texture. I love using this old washboard as the focal point on the shelves. 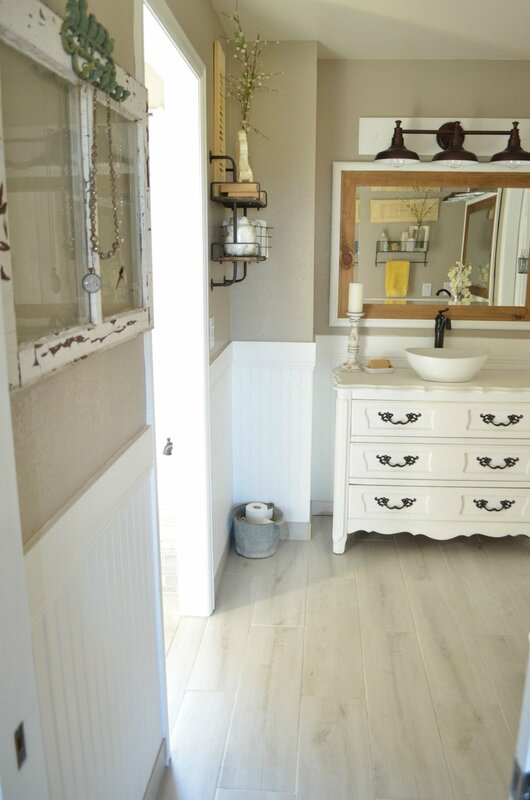 It really draws your eye up and the neutral color blends seamlessly with everything else. I have a slight obsession with vintage jars. This one here belonged to my Granny and has been around for years and years. 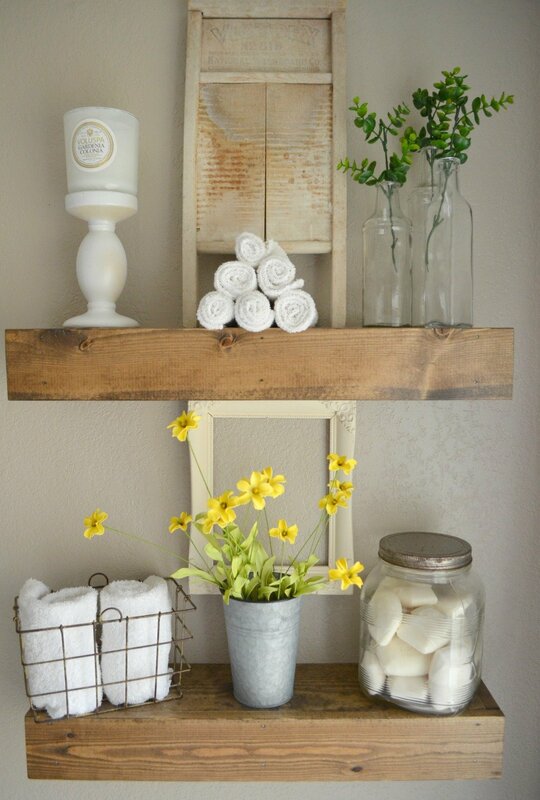 Using it to store soap gives it a practical use, all while adding a ton of charm to these shelves. 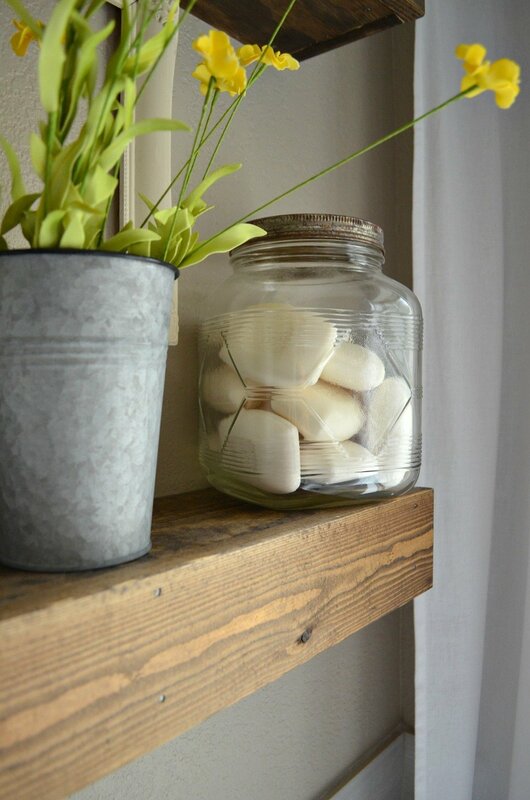 Definitely bring out any old jars you have and put them to use! I love these industrial style shelves, it’s a perfect fit for this space. You can find it here on Amazon. Yep, old books for win–even in the bathroom. 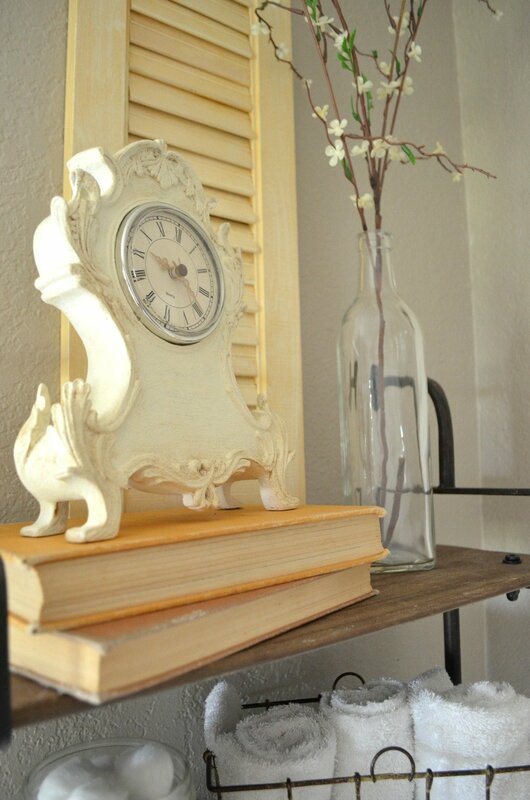 This little stack is perfect for displaying my old clock, which is another one of my favorite finds ever! So beautiful! Great inspiration in this post and my personal favorite way to decorate ???? Thank you my friend! I know it’s near and dear to both of our hearts! 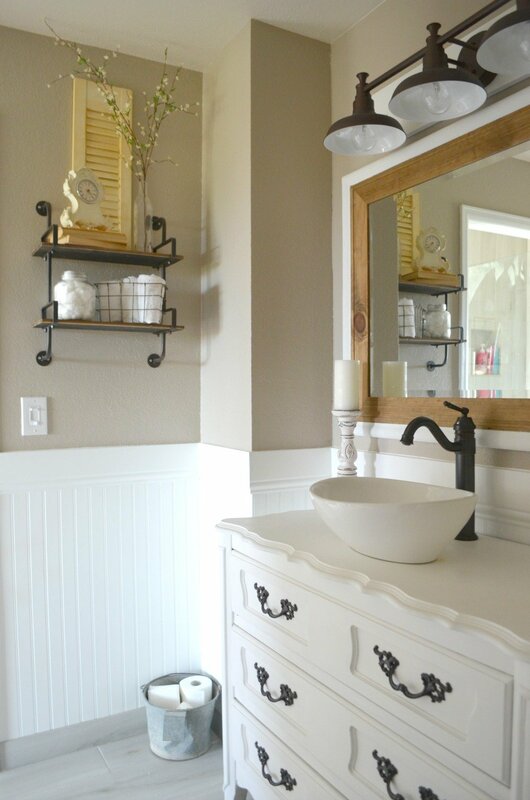 I love all of the different layers and those vanities are beautiful! Stunning space Sarah!! I love it all! I agree layering of textures makes everything pop!! 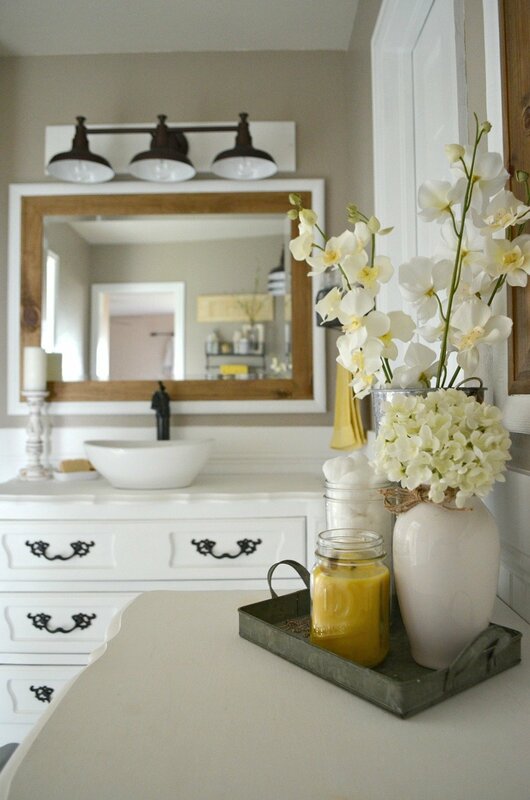 Love the neutral colors with a touch of sunshine!! I love your style girlie???????? Summer! You’re too dang sweet! Thank you so much for putting this all together, you are awesome to organize it all! And I’m just honored to be a part of such a great group of talented bloggers, it’s been a lot of fun! LOVE this so much! 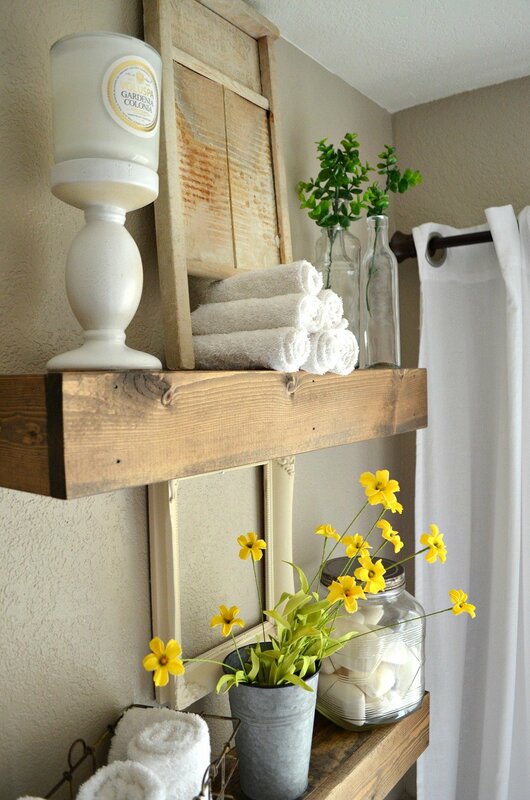 I think adding vintage to a bathroom is wonderful and you’ve done it with such style. 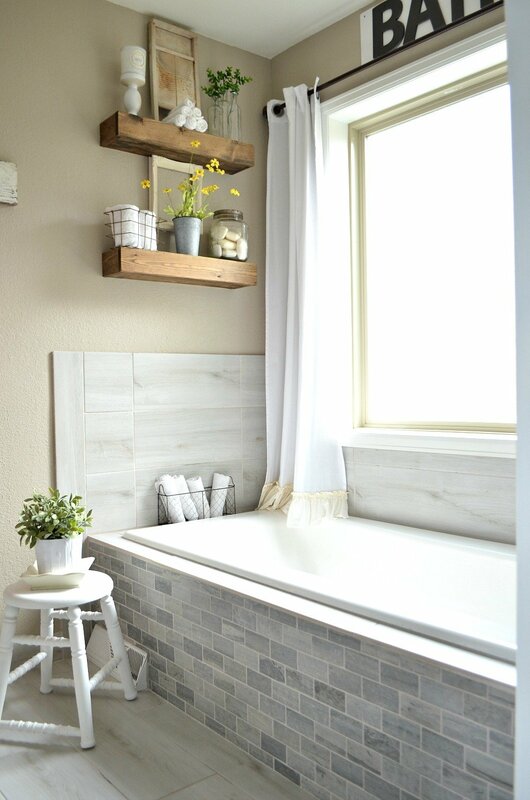 Your tub is gorgeous – and I love your sink too! You have totally inspired me to make my house farmhouse style. I love how you decorate. Your house is goergous. I can’t wait to see your next post.!???? Can you please tell me the name of the paint you used? I love it!!! Yep, it’s Smokestack by Behr. I love those curtains!! Where did you find them? I love everything about this bathroom! Could you please tell me the name of the floor tile you chose? Sarah, you always make things beautiful. I love the yellow touches so much I felt inspired to get two yellow lamps (with white shades) as my bedside table lamps. I have been adding in little yellow items into my bedroom and have a throw my grandmother had that has the same yellow shade as the lamps in it. 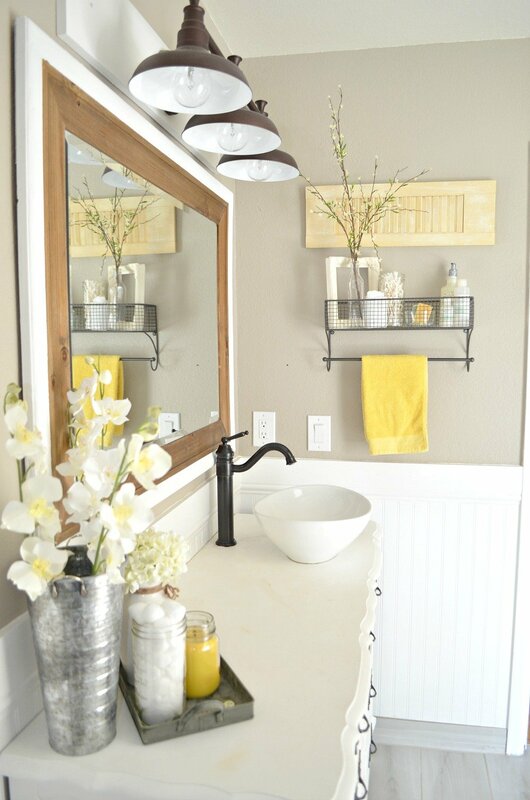 You did the most cheerful yellow in your home, and it is so beautiful how you put everything together. Your home is always full of charm! What color paint is this? I just found your blog and it’s beautiful! Can you tell me where you purchased your shelves? Not the industrial shelves but the ones you have your Granny’s jar on. Thanks! What is the color you used on your walls? I love your design and decor of your master bathroom. The mix of new and vintage finds is just my style. My favorite weekends are spent antiqueing and junking with my husband and daughter. Thanks for sharing! !